I put the Leica 280mm f/4 Apo-Telyt-R on both the a7R and a7RII, mounted the lens collar to an Arca Swiss C1 head on a set of RRS TVC-43 legs, set the whole thing on a vinyl tile over 6 inch concrete floor, and made some slanted edge photographs at various shutter speeds. With the a7RII, i used the mechanical shutter for one set of images, the electronic first-curtain shutter (EFCS) for another, and the all-electronic — silent — shutter for a third. This is a harder test for the mechanical shutter than yesterday’s, since using the lens collar as the tripod mounting point allows the camera to move more than mounting the camera body directly to the tripod. Unfortunately mounting a big, heavy lens like the 280/4 to the front of the camera unsupported is a recipe for damaging the lens mount. The first series of images was made with the camera in landscape orientation. That’s easier on the mechanical shutter than portrait orientation, since tripods are stiffer in the up and down direction than they are from side to side. Then I said “what the hey” and made a series in portrait orientation. As a total aside, why can’t all lens collars have crisp detents every ninety degrees like this Leica lens? You want the good news or the bad news first? The bad news? I thought you were tough. Brace yourself. Here it is. Although Sony said that they increased the damping of the a7RII shutter over that of the a7R (and I have no reason to disbelieve them) with a long lens like this it doesn’t make much difference. That’s because the bulk of the motion imparted to a tripod mounted mirrorless camera with no added delay between winding the shutter and firing the first curtain comes from the winding action, not the motion of the first curtain. That is especially true for a big lens which has a relatively low resonant frequency compared to a small one. Okay, are you ready for the good news? Thought so. The EFCS on the a7RII works great. In fact, it works so well that going all the way to silent shutter mode doesn’t bring any significant improvement on single shots, although it almost certainly would on a series of exposures made in a short period. First, I’ll drag you through the protocol. Manual focusing wide open, then lens set to f/6.9 (halfway between f/5.6 and f/8). Self timer set to 5 seconds on the a7RII and 10 seconds on the a7R. Camera on an RRS TVC-43 with an Arca Swiss C1 head, RRS L brackets on the cameras, but not used for mounting. Lens collar mounted to head with RRS generic plate. Crop, export as TIFFs, analyze for horizontal edge (that’s the edge perpendicular to the way the shutter travels) for the landscape shots, and vertical edge (that’s the edge perpendicular to the way the shutter travels)for the portrait shots. Measure MTF50 in Imatest . The blue curve is the a7R, and the red the a7RII with the mechanical shutter engaged. 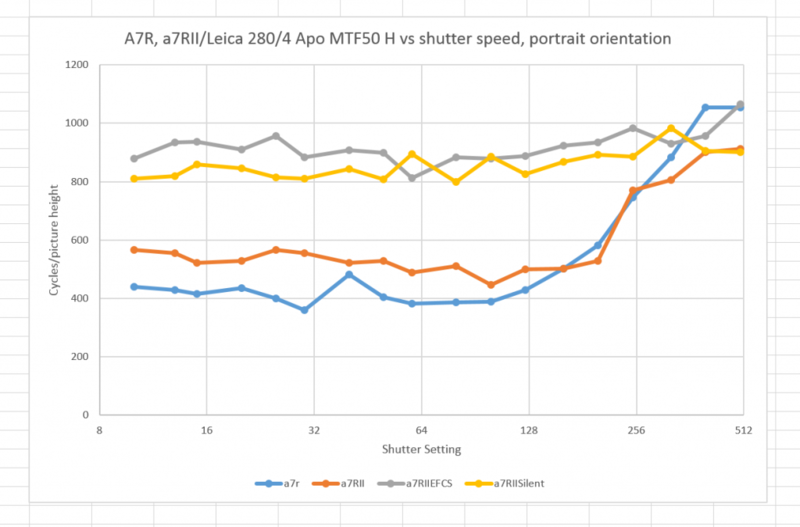 Looks like the a7RII mechanical shutter is a bit better than the a7R one. The grey curve is the a7RII with EFCS on, and the yellow curve is the a7Rii with silent shutter on. Not much difference between silent shutter and EFCS. Above 1/160 second, you can throw a blanket over all the curves. Not much to choose between the a7R and a7RII mechanical shutters, or between the EFCS and the silent shutter. Let me point out a couple of things. It’s real close, but the EFCS actually appears to be a hair better than the silent shutter. What’s up with that? 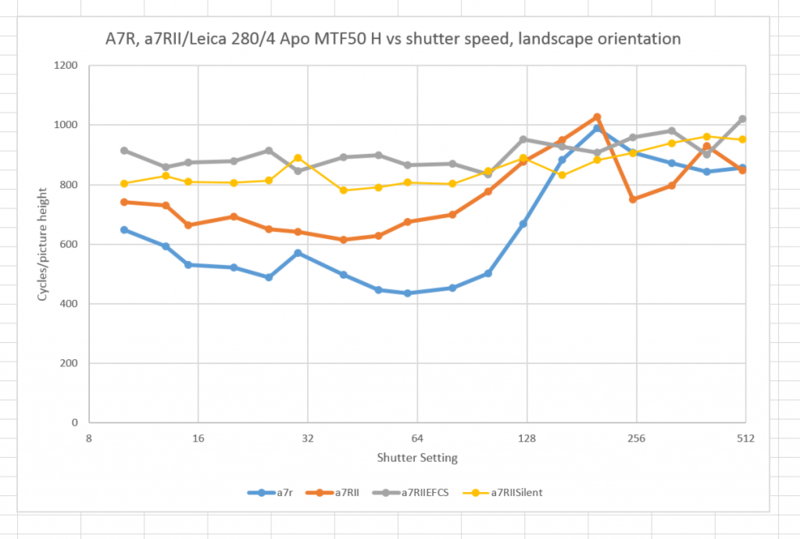 I suspect it’s because the a7RII drops to 12 bit precision in silent shutter mode and the read noise picks up. This lens doesn’t appear to be as sharp as the 180/3.4. How come? I think the main reason is that I couldn’t get far enough away from the target. Thanks! for all these well done tests. An aside: I’m curious if you notice any measurable image degradation with the variable neutral density Heliopan 77mm filter. Not until you get to very high attenuation. Excellent stuff, Jim. Re EFCS vs Silent performance: I don’t think a 1 bit difference in the encoding at these contrast ratios should affect MTF results obtained through the slanted edge method. Even if a quantization error were introduced it would look like additional noise in the Edge Spread Function, which would show up as modulation of the results: but here the average is consistently lower. What ‘s the difference in terms of mechanical parts that move between the two modes? So for underwater shooting in the 1/30th – 1/200th range, it seems like it would be better to use EFCS to keep 13 bits (since all the data is in narrow band of the blue) and the speed isn’t fast enough to cause shutter exposure unevenness. In order to get 13 bits, I have to avoid bulb, and continuous drive, is there anything else I have to avoid? Thanks for your hard work on exploring this camera! Bryn, I think you’ve got it. Point of clarification, does the bracketing mode (sort of continuous drive) drop to 12 bits? Sadly I have an A7r and don’t feel inclined to fork out 3k for the Mk2 version at this point. Whats the best fix for me? Does the additional of the battery grip fix the problem? Or do I need kryptonite machined weight screwed to the arse of the A7r to stop the shake? I note shooting over 1/150sec is ok from my tests. But Iwould prefer the stop the shake!